I’ve always been a bit wary of dogs. Perhaps it was growing up in a non-pet family. We had the occasional pet like the odd fish and a couple of kittens that came to premature ends due to our suburban life (cars and cats… not a good mix), but never any enduring critters. Perhaps it was being bitten by an Alsatian when I was delivering pamphlets, or my sister being bitten by one when just out playing with friends… but dogs I am happy to give a fairly wide berth. However, I’m not a complete dog-detester like my friend Valerie, don’t get her started! Such wonderful vehemence… one year I found her the perfect birthday card that had a picture of a yippy sort of dog on the cover, and the caption ‘People who own dogs are just too scared to bite people themselves’ – captured her sentiments exactly. But moving to St Louis has brought some wonderful dog-owning folk into our midst. I do think that good dog owners can make interactions with dogs a lot better for those, like me, who may need a little convincing. So far, I have loved all the doggy friends we have made here. We may never be dog-owning folk ourselves, largely due to the somewhat transient nature of our current lifestyle. I think animals need stability and familiar territory, and that is something we could not offer right now. Should we ever settle down, then maybe pets will be on the agenda. 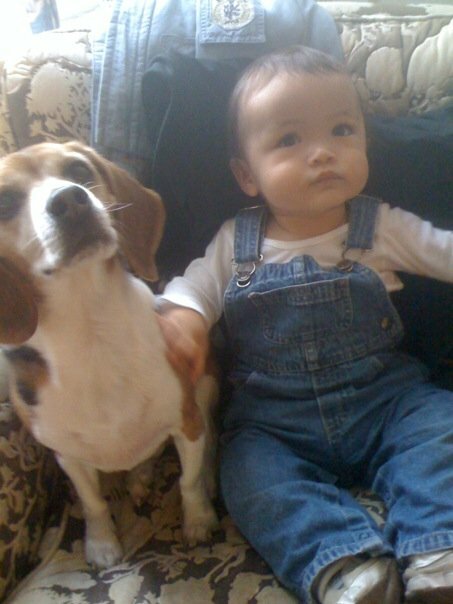 With that in mind, I do want Kazuo to become familiar with friendly animals, in much the same way as I want him to become familiar with other children right now… So yesterday we had a play date with Katie and her lovely little beagle, Sam. Kazuo was a bit wary at first – the last little canine encounter was with our friend’s dachshund who is of a slightly nervous disposition. She was equally friendly and inquisitive, but her intense little barks gave Kazuo a bit of a fright. 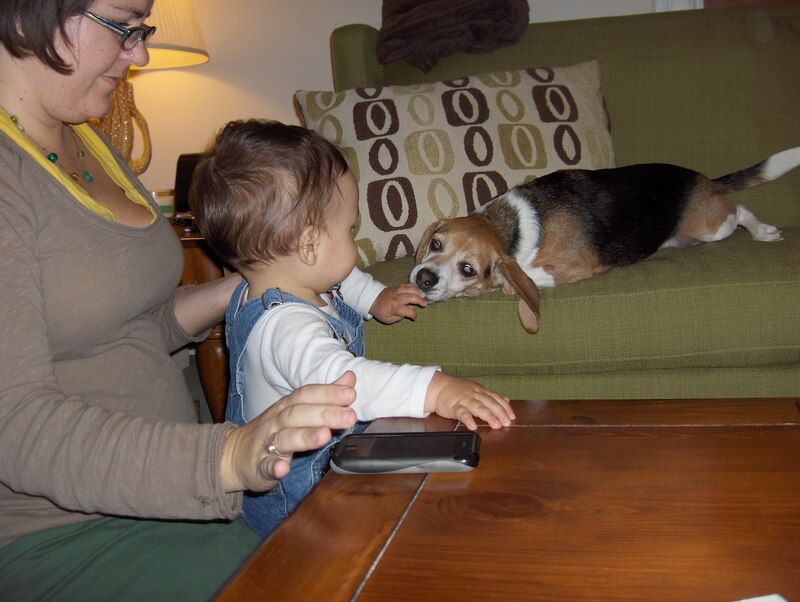 But it was not long before Sam was getting in lots of doggy affection and Kazuo was reaching out to be friends. I am grateful to Katie for her hospitality, and to Sam for his lovely placid nature and the fact that he is just the right size for our pop just now. If we ever make it to pet-owning status, a little beagle would be very welcome in my house!